Haryana Steelers defeated the team of Bengal Warriors on Tuesday in season 5 of Pro Kabaddi League from th (PKL) on their best performance. In this match played at Netaji Subhash Chandra Bose Indoor Stadium, Haryana defeated Bengal by 36-26. 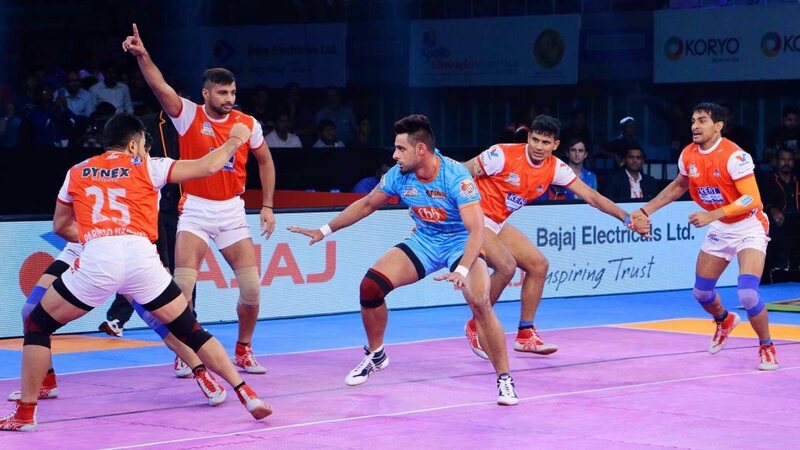 Maninder Singh raised 14 points for Bengal Warriors Because of them, Bengal came closer to victory in the last moments of the match, but as soon as they got out Bengal's mouth was struck. The Haryana Steelers team seemed to dominate Bengal Warriors from the start, though Bengal had a good fight for the first two minutes of the first half but after that it went backward. Haryana Steelers was ahead of 3-1, but Bengal Warriors equals the score. After that They went behind continuously. The score was 4-9 and Bengal was close to getting all out. In the 10th minute, Wazir Singh all out Bengal Warriors for successful raid striking and Haryana Steelers got ahead by 12-4. In the first half, he could not reduce the gap of these points, and Haryana Steelers took the lead 19-11 on the Bengal Warriors. In the second half, Bengal Warriors played a lot better game. In the second half, they did not repeat the mistakes of the first half and started taking points continuously, but in the meantime he could not prevent Haryana Steelers from taking points, which was not causing the difference in numbers. Haryana Steelers was ahead from 15-28. Bengal Warriors has made a great comeback and prevented Haryana from making points. In the 34th minute, Maninder Singh scored a successful raid, scoring 27-32 with four points. It was felt that the hosts team **Bengal Warriors** would return to the match. There was absolutely pressure on Haryana Steelers, But then the star of this match Maninder Singh of Bengal Warriors went out and then when the match was about to finish the match, Wazir gave two important points and once again strengthened **Haryana Steelers** and brought Bengal Warriors under pressure. Haryana was ahead of 35-29. It was impossible for Bengal warriors to get a gap of six points in the last minute and They had to face defeat at home.